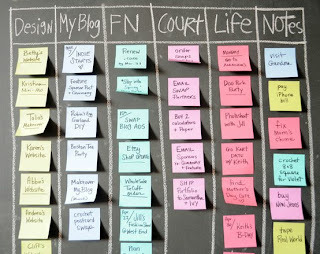 For a while now I've had a case of home office envy ever since I saw a blogging friend with an office blackboard that looked like this. And that was just the start of her fantastic office space. She told me that the key to organising a home office is to find a place for everything (and label it), remove clutter, set up good systems and get rid of things you don't need. 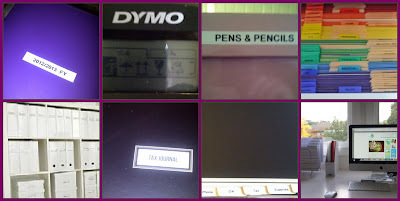 So when I was offered the opportunity to review a couple of DYMO's business products I jumped at the chance hoping I would get some help to make my office even more professional looking. 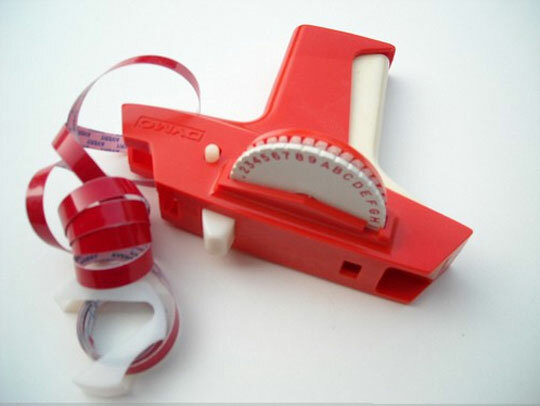 When the products arrived I was amazed how DYMO® machines have changed over the years. I am sure you can remember the early products that used to produce multi coloured labels for everything and anything. Like this one. They are nothing like that now. Take the DYMO® LabelMaker 160. It is a hand held device and very easy to use. It takes 6 AAA batteries but also has an optional AC adaptor if you prefer. You just type your text in, format it with one-touch Smart Keys for text size, bold, italic, underline and vertical text and then you print. It is really easy to create professional-looking labels. You can use up to 228 symbols and clip art images and it prints on a variety of coloured labels. I tried it using black text on white tape but I would prefer the black text on clear tape which is also available, as it would be more versatile with different coloured stationery. Of course I labelled everything in sight. It is a great, easy to use product for the home or office. 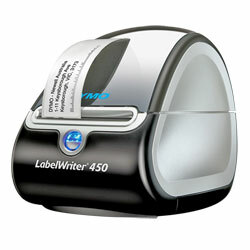 Then, I was very excited to try the DYMO® LabelWriter™ 450 label printer. It is the most popular of DYMO's label printer range. It is really small and compact for the job it does. It comes complete with USB and power cables, DYMO LabelWriter labelling software, a starter roll of address labels, User and Quick Start Guides and a cleaning card. It uses thermal printing technology that eliminates the cost of ink or toner. It allows you to choose from 100+ label styles and layouts and you can also quickly and easily set-up your own custom templates. I found it very easy to use and it's going to save me lot of time when I am printing address labels for envelopes. It can apparently print 51 labels per minute. You can also add graphics and art which might be fun as well. I tried it on both Mac and a PC and had no trouble at all. I was able to print from within Word, Excel, Outlook and MYOB. 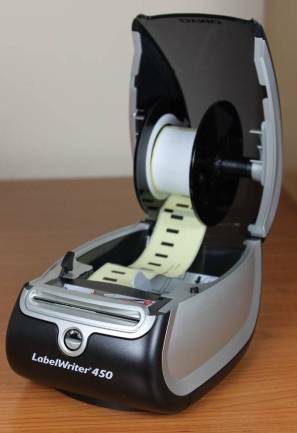 It prints on a wide variety of labels such as media, name badges, shipping labels and multi-purpose labels. It is black print only and it would be great if it could print in colour too. However, given that is not costing anything in ink I am happy to forgo the fancy colour. 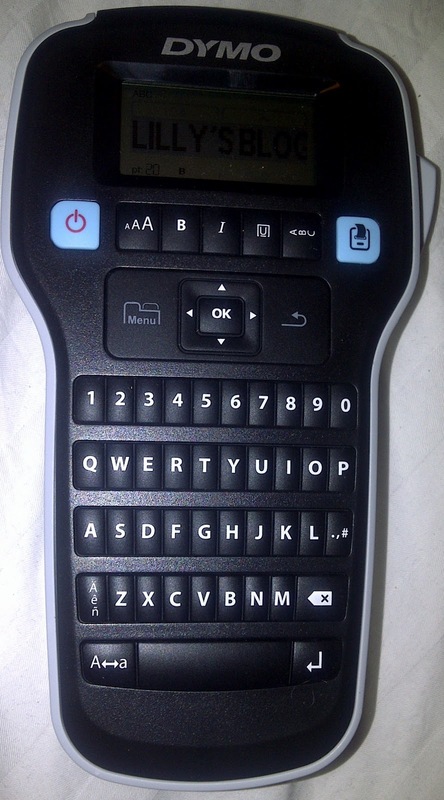 When not in use, the LabelWriter will go to ‘sleep’, with the blue power light dimming to show that it is in power conservation mode. However, there is no off button so to completely switch it off you need to do it at the wall. I had fun creating a lot of different labels just to see what was available. I think I am going to get a lot of use with this machine and it will help my business look more professional. You can purchase the full range of DYMO products at Officeworks . If you would like to win both the DYMO LabelMaker 160 and the DYMO® LabelWriter™ 450 machines for your own home office or small business enter HERE. The Giveaway closes at midnight on Saturday, 13 October 2012. 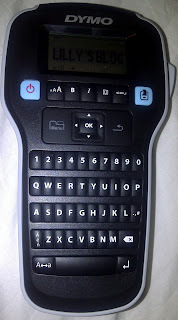 Note: I was provided a Dymo LabelWriter 450 and a Label Maker 160 for review and another set for a giveaway. As always, I made it clear to the supplier that this does not mean that it buys a positive review. Any reviews I do are based on my actual experience and opinions and are not affected by offers of free products (unless it happens to be Chocolate or Botox, then all bets are off and ethics goes right out the window...joking). Great review Lilly......of course I have entered your giveaway! Hope you are having an excellent weekend. It's a long weekend in NSW so I have an extra day to lap up the sunshine. Thanks Peggy! Hope you enjoyed it all. Wow! This is certainly different from that old label maker. 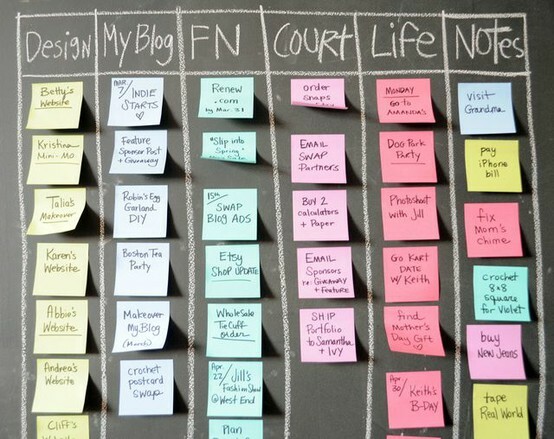 I could have really used something like this when I was teaching. I have created labels on the home printer in the past and I must say the tough part is getting words to line-up correctly. This could useful if I started doing my ebay related shipping. They are really great - I can't believe how much the products have changed since I used Dymo years ago Bill. this sounds fantastic, and interesting about thermal printing technology Lilly. I like the labels that you made, very professional looking! Thanks for the review. I would like to try these machines, there is an inner organisation geek in all of us I reckon. I really like the look of the second one because I do a lot of labels and at the moment I use huge sheets of stickers which is ridiculous because i cant print one at a time like this one could. I entered because I really want to win this one. This would definitely help then as that is what I thought when I used it that I could just print one sticker off at a time. I love my dymo machine. I label anyhing that can't run away from me. I even labelled the cats bowls so they know which one is theirs - that disturbed people given they told me cats can't read. What the heck. Yea, I'm a hoarder but tidy one! Curiously, a large nubmer of young males have entered to win this giveaway. What the hell is the go with that? Not the target market I would have predicted. Boys and their toys perhaps? I love Dymo machines but gee these have gone upmarket a bit now. I entered the comp too, let me win, please??? Can any of the label makers print in colour do you know? Not these ones, ecspt you can get coloured tape so its like printing in colour Anton. I would love the one that makes the labels, it would save me soooooooooo much time by the look of things. Dymo certainly has come a long way. I really need these to help me in my home office too. It might help me get more organised. I remember the old ones. What a big difference. Machines are usually powered by mechanical, chemical, thermal or electrical means, and are frequently motorized. Such machine is in trend these days. People prefer this because of its performance and reliability. It provides you the perks of organising the office at home.